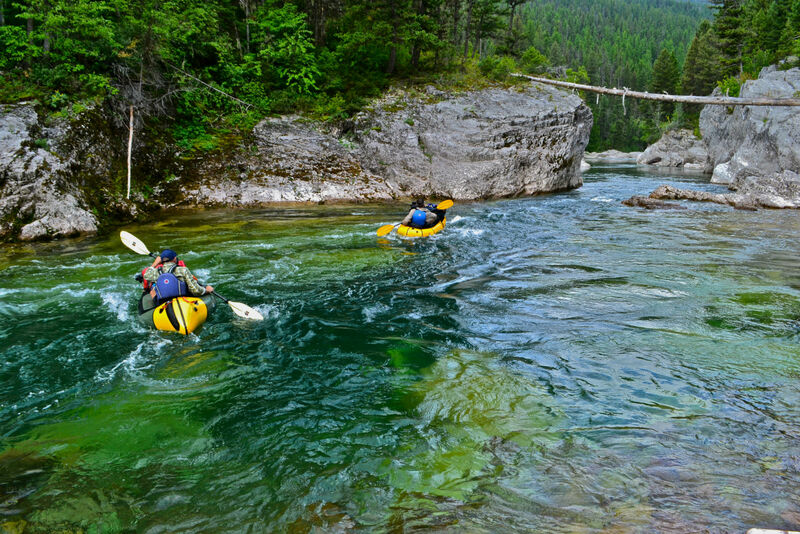 The South Fork of the Flathead River in northern Montana flows 40 miles through the Bob Marshall Wilderness like a river in a bygone era. It’s a land of soaring alpine peaks and gin-clear streams, but unlike other wilderness areas, it’s a stronghold for horse packing. The guys and gals who run mule trains back there hunt elk, ride horseback with rifles, and look like the Marlboro Man. That’s why I felt a bit self-conscious as Greg, Tom, and I hiked back there with oversized backpacks and two-piece kayak paddles sticking above our heads like colorful antennae. 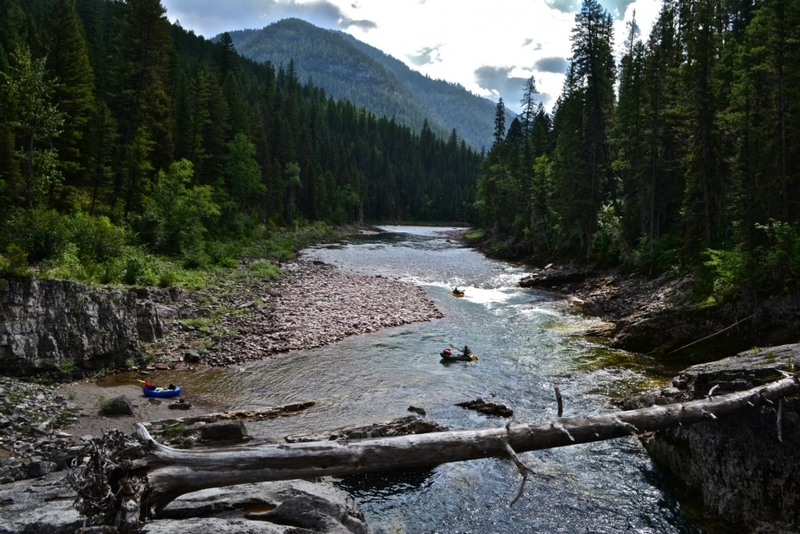 The Bob, as it’s called, is one of the largest Wilderness areas in the lower 48. 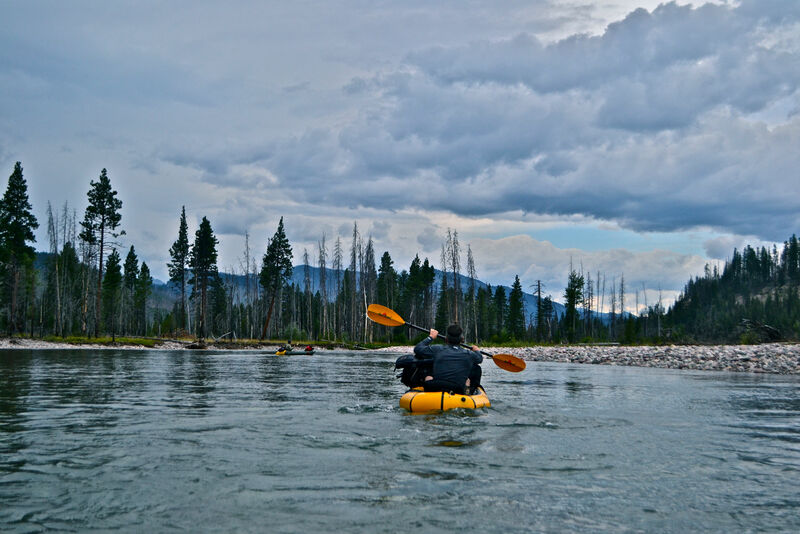 To reach the South Fork, boaters traditionally go by bush plane or mule train, but now, with the advent of the packraft, you can simply walk 22-miles to the put in. When we walked past our first mule train, however, it was clear that our kind was newer to these parts. The couple on horseback sized us up as if they were trying to determine our species. “Where you guys heading?” the man in the Stetson asked. The man gave a little nod, as if this made sense, but then he asked, “In what boat?” and we explained to him. The packraft is roughly a five-pound inflatable kayak. They feature inflatable seats, closed floors, and optional spray skirts to keep waves out. 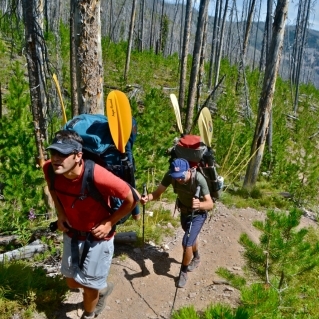 They were first developed in the 1980s by wilderness adventure racers in Alaska. They used those early prototypes to cross dangerously swollen rivers. Then guys like Roman Dial began using them to explore the Brooks Range, Tasmania, and other whitewater destinations around the world. 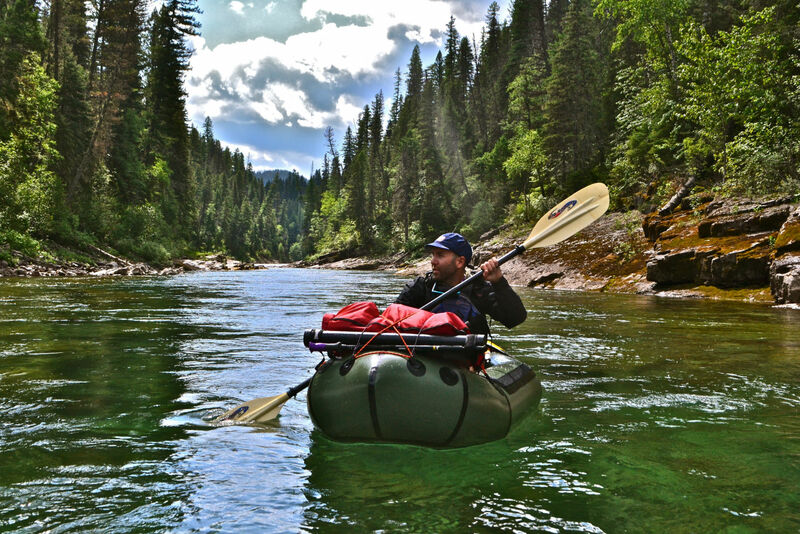 It was Dial who promoted packrafting as a key to unlock remote landscapes by moving fast and light. The mule train couple wished us good luck and we continued on toward Young’s Pass. In the late afternoon sun, I sweated a Rorschach test through my tee shirt and began wondering what I got myself into. We had completed eight miles. We had 62 to go. On paper, five days seemed reasonable, but climbing this pass while giving a baby gorilla a piggyback made me question the itinerary for three 30-something-year-old office workers. 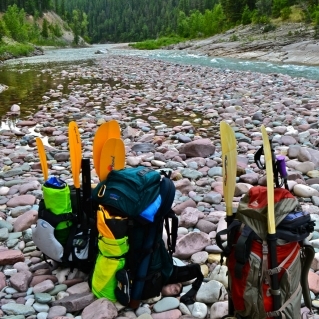 Not to mention, this was our first packrafting trip. The sun was beginning to dim beyond the distant mountains and it looked like we’d be hiking late into the night. My shoulders burned and the waist belt pinched. As I shuffled along, I adjusted the pack every few steps. 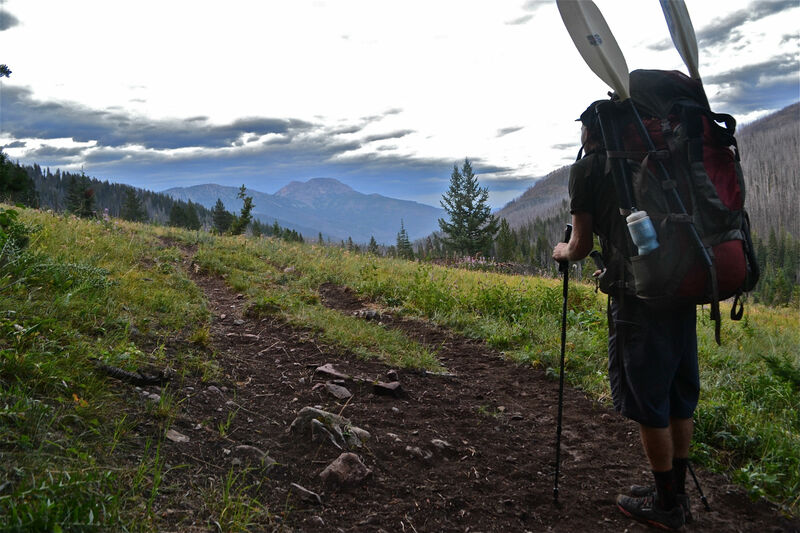 Besides my tarp, sleeping bag, and pack, I had a five pound boat, a two-piece aluminum paddle, a pfd, a fly rod, five days of food, a pair of sandals, a down jacket, a rain coat, a camera, a 45-liter dry bag, a few pairs of socks and underwear, toiletries, parachute cord, three liters of water, and a flask of whiskey. My pack weighed an easy 60 pounds. After the first 10 miles, I poured out two liters of water and began snacking vigorously to lighten my load. When we arrived at camp, a makeshift spot in the dark, we kicked some branches aside and set up our tarps. It had been a long time since I had felt so sore. I groaned when I sat down to fire up my stove, but after such a challenging hike, I was thankful I brought dehydrated dinners that were easy to cook, eat, and clean. After dinner, the three of us retired to our sleeping bags and I slept as soundly as a rotting log. We put-in on Young’s Creek early the next morning. It was such a relief to transfer the load from our backs to the boats. I stuffed everything, including my pack, into the 45-liter dry bag and rigged it to the bow with parachute cord. I flattened my sleeping pad along the interior floor and shoved my fishing rod along the side tube. The first few strokes made me laugh out loud. Blissful, transformed motion from land to water. This metamorphosis is what a caterpillar must feel when it leaves the cocoon. We had 40 miles of Class I-II water ahead, but soon we came to a narrow gorge that looked dicey in our boats. In our excitement, we put in too early above Young’s Creek Gorge, which is a Class III boulder garden. We lined our boats, portaged sections, and banged up our ankles and toes. We had fallen behind again, but time flew by en route to the South Fork. 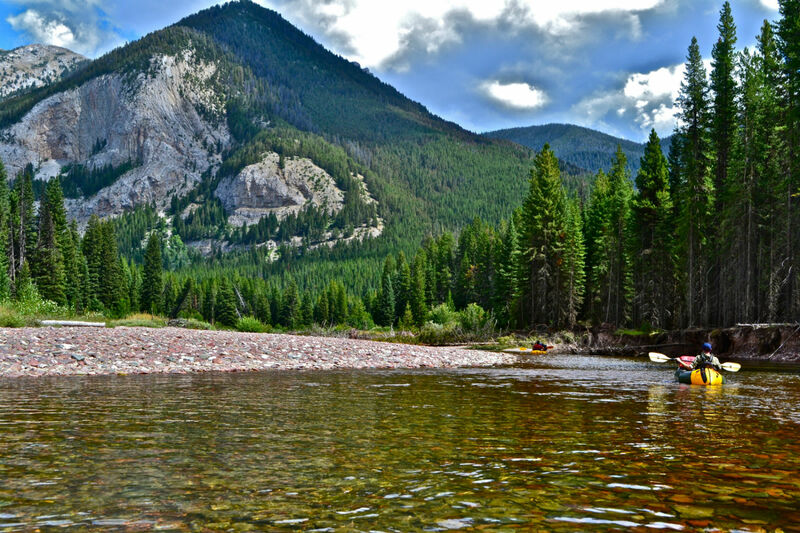 Where Young’s Creek and Danaher Creek meet below Flatiron Mountain is where the South Fork of the Flathead begins. The river meanders through a vast floodplain and mountains rise sharply to the east and west and divide into many drainages. Here I started to feel the remoteness. Mountains surrounded us in a wilderness the size of Delaware, and as we floated on, it began to feel like we were traveling back in time. 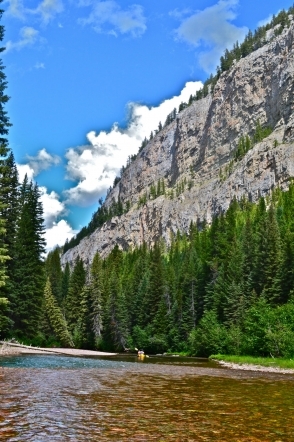 We passed horse packer camps with beautiful horses tied between ponderosas, we’d hear the barking yips of a camp dog, and see white canvas wall tents set up along the banks of the river like this was a pioneer route from long ago. As darkness fell, we pulled out, made camp, and started a driftwood fire on the river stones. We sat around the campfire watching a thunderstorm light up the horizon. Jagged bolts of lightning struck the mountains and it made a beautiful backdrop for another dehydrated dinner and another slug or two of whiskey. In the late night hours, the thunderstorm came directly overhead. This is when we really felt the decision to bring tarps and not tents. Tom fared the worst of us because he didn’t bring poles to support his tarp so he relied on tying it to the only available option—a cottonwood sapling and a pile of rocks. I’ve never heard thunder so loud or seen lightning so bright, and for a few minutes I wondered if we all might die. But the storm passed quickly and we soon fell back to sleep. We awoke early to cover big miles on the river. We paddled along the dark jade current that flowed over polished stones. 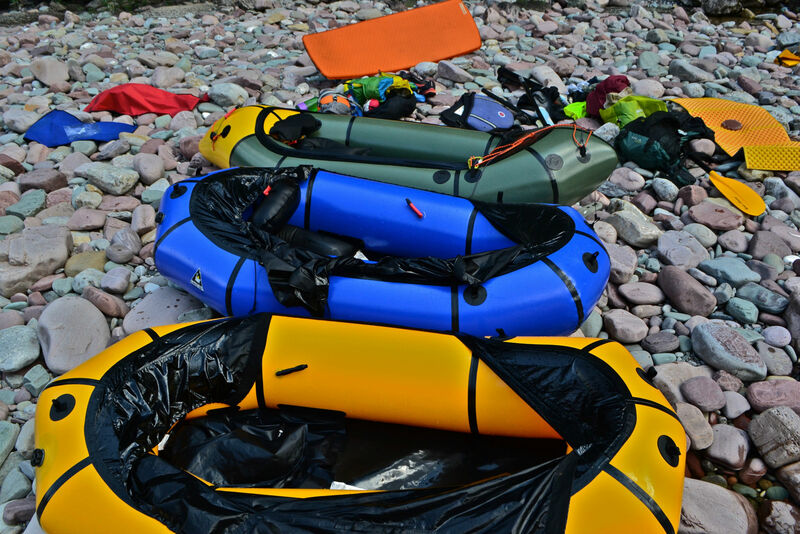 At bends in the river we encountered logjams, but the packraft turned these nasty snags into a harmless ordeal. Two of us would grab a hold of the bow and stern and carry the boats over the logs. After one such portage, I finally constructed my four-piece fly rod. 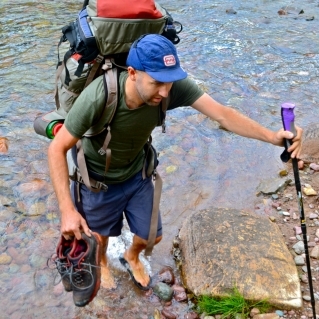 I was glad to use it because I had carried it all the way here, and because the South Fork is a renowned fishery. 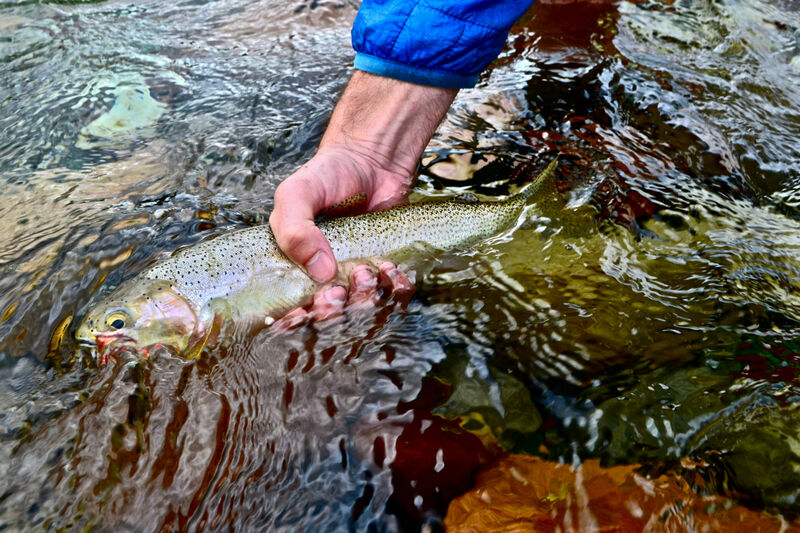 The trout receive very little fishing pressure back here, and have not learned to discern imitations from reality, and for three amateur fishermen, that’s a good thing. I tied a parachute adams onto my line and landed a fish on my second cast. As we traveled downriver, mountain creeks added volume to the South Fork and we slalomed through boulder gardens and punched through waves. For most the trip we didn’t wear our lifejackets because it was flatwater, but now we dropped through some heavy waves where I felt the power of hydraulics and we all pulled over and immediately put them on. That afternoon we passed a guided fishing crew. Two silver-haired clients sat with shoulders hunched in the bow of the raft. A light rain pockmarked the surface of the river and turned it slate gray. A guide on the oars tied new flies onto their lines, and when we got into range he peppered us with excited questions about the weight, durability, and cost of packrafts. I gave him rave reviews on all accounts, except that I wouldn’t call the hike over Young’s Pass fun. I could see in his eyes what he thought. We were light, nimble, and free to go wherever we pleased. “You guys have a great trip!” he yelled as we drifted ahead. The next few days we entered into the rhythm of the river. We portaged logjams, fished for trout, ran boulder gardens, and waited out passing thunderstorms drinking whiskey under cottonwoods. I can say with ease those were some of the best days of my life. We had to work hard to get back there, and we felt that effort every day, but the reward was as big as the wilderness. 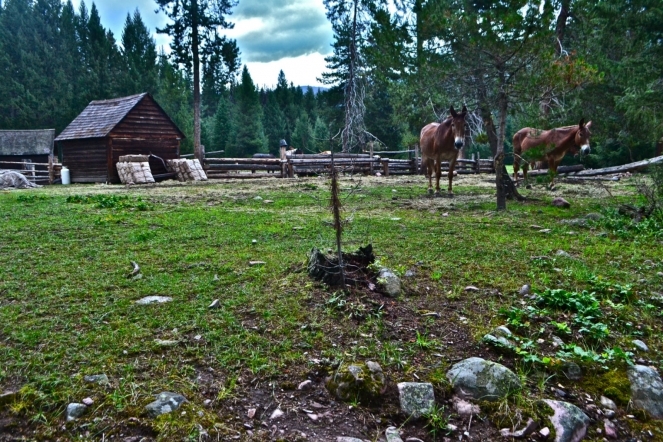 As we neared our last camp at the Bear Creek Ranger Station we saw a mule train coming down a mountainside. The Marlboro Man in front wore a long leather duster and a wool cowboy hat. His mules carried oversized canvas panniers and their hooves clapped upon the stones and kicked up a trailing cloud of dust. As we drifted along the cool green river, the pack train headed over the wooden suspension bridge before us. The Marlboro Man lifted his hat in greeting, and we, passing beneath, our paddles. I imagined for a moment what we must look like to the Marlboro Man, and I thought about how some things change and others stay the same out here in the wilderness. I drifted a circle and tried to absorb the scene. I felt the pain in my shoulders and the blisters on my feet but they didn’t bother me now. I watched the dusty mules disappear into the forest and started paddling again to catch up with the guys ahead.